Quote Reply Topic: My balance is negative!? 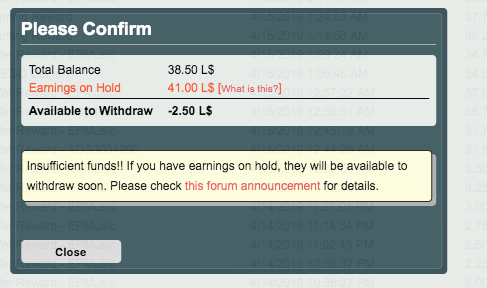 OK so yes i do have some money lindens on hold but I also have some other lindens so the lindens I have on hold is 41 but the total balance i have is 38 so if i try to withdraw the balance is negative (-2) i'm losing faith now. Just want know when would my payment be available. I got my last payment on March 18th. Above error (negative L$ balance) happened to a dozen or so SL accounts. We are looking at the withdraw logs to fix. The missing L$ are being credited to your account as "EP Community Reward". Will this be fixed with every account it happened to?